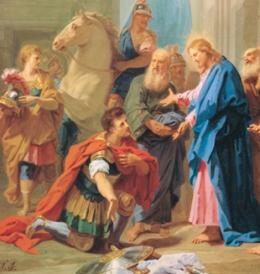 In the Gospel for the Third Sunday after Epiphany we read the story of the Centurion, who said to Jesus: “Lord, I am not worthy that You should enter under my roof, but only say the word, that my servant shall be healed.” The Church has adapted these words and repeats them three times before Holy Communion. Yes, we are unworthy, but we must prepare ourselves and bring ourselves to the Lord's table. “So great is the efficacy of the adorable Eucharist, that one single Communion, if well made, would suffice to raise us to sublime sanctity.” (In the book, Solid Virtue). Elsewhere, in the same book, we are told one Communion is sufficient to make us a saint. Consider this well. We are approaching the holy season of Lent. We should also prepare ourselves to make a Communion so well, that God makes us saints. Let us pray to Him for this holy grace. Let us focus our meditations and our thoughts outside of our time of meditation on the "best part" (Luke 10:42) as did Saint Mary Magdalene. And what was that best part? It was sitting at the Lord's feet, hearing his word. Not just letting the words of the Lord going in one ear and out the other. But to take it in...to soke His words up....to take Jesus words to heart. Allowing His words to change us from the inside out. If we do this, if we will sit at His feet and truly listen to His words, Jesus says, it will not be taken from us. This must be the best Lent we have made in our lives, but why wait until Lent. Let us begin bringing our hearts and our minds to Almighty God. Let us ask Him to help us in this holy task. Note, We recommend you look up the Scriptures that We and others make reference to.